Bags of fun.... 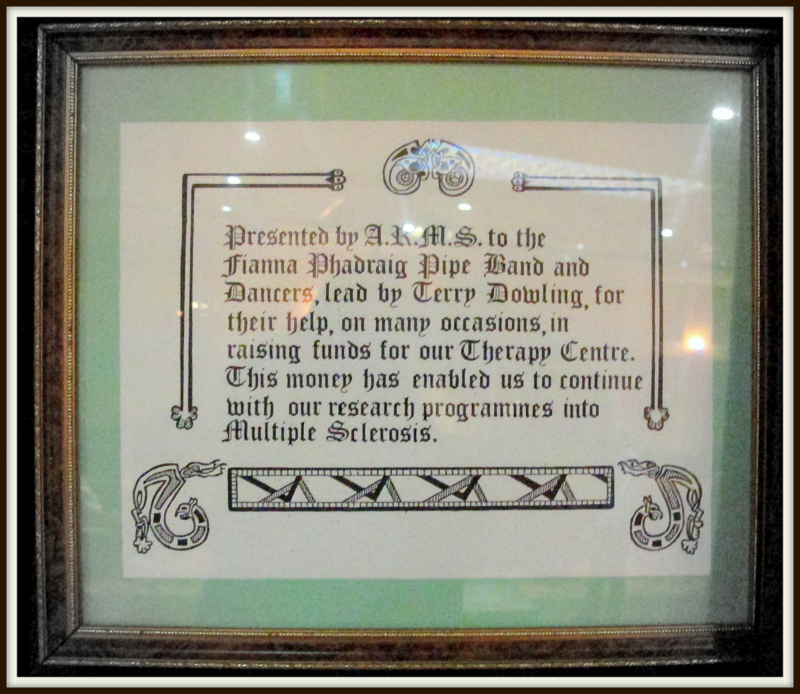 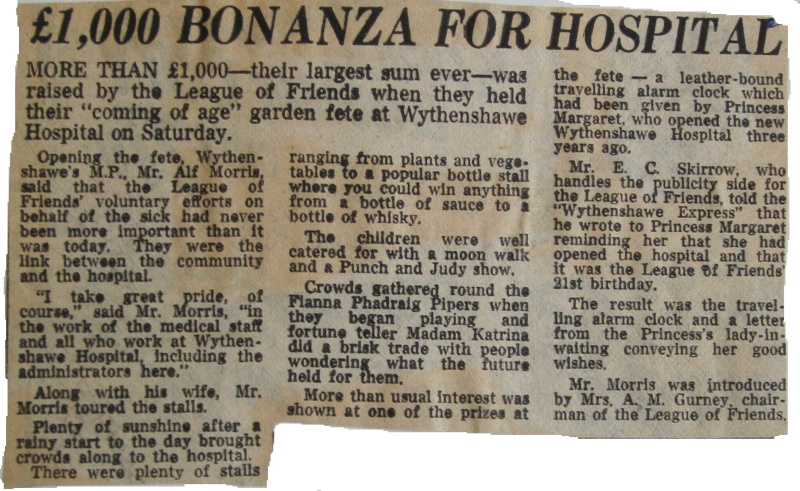 The Band has been a faithful supporter of the Wythenshawe Hospital League of Friends for over half a century. 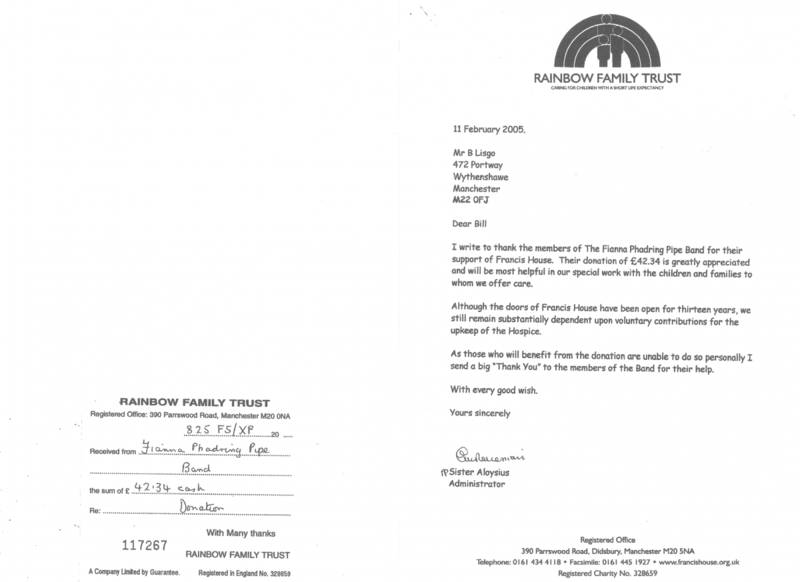 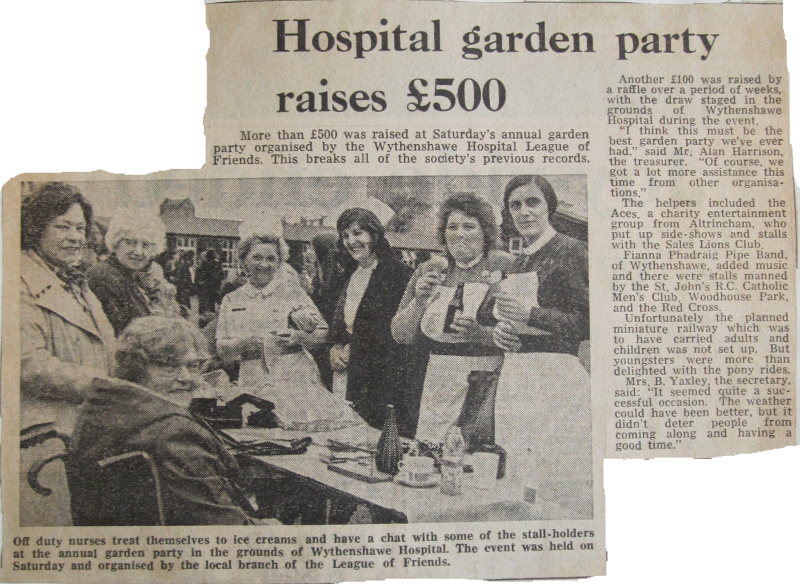 The League of Friends volunteer team raise money to support the hospital by running the hospital's tea bars and organising events such as the annual garden party, to which the Fianna Phádraig Pipe Band donates its services whenever invited. 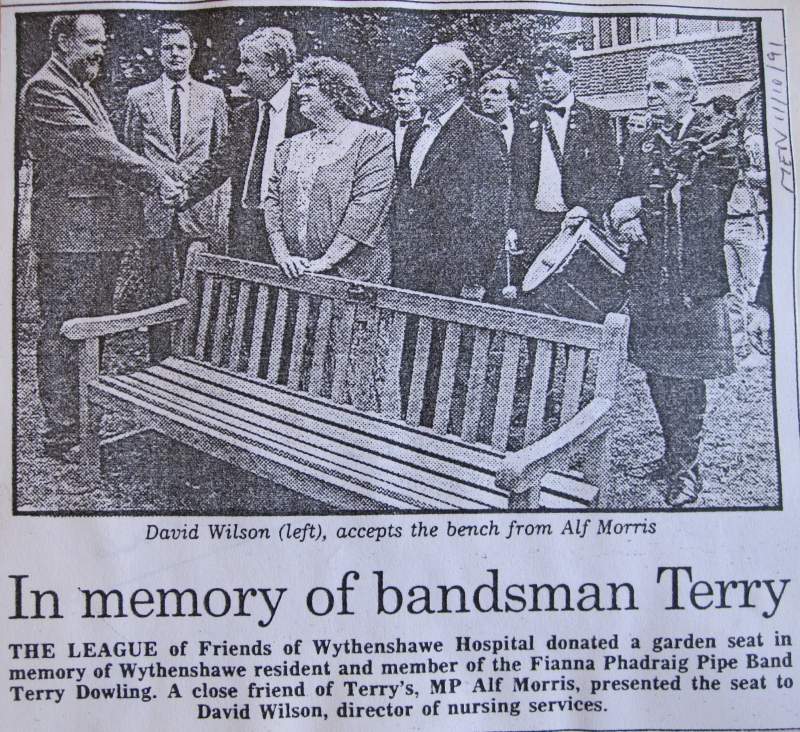 Over the years, the League has raised hundreds of thousands of pounds "to help patients, former patients and those in the community who are sick, convalescent, disabled, handicapped or infirm"
In his column opposite, Eamonn O'Neal talks of the Band's commitment to the League of Friends, while the photo below dates back to one of the Band's very first performances for the League, then known as the Wythenshawe and Baguley Hospital League of Friends, in the late 50s or early 60s. As you can see on the banner, the Band gets top billing, with tickets sold for the princely sum of one shilling! 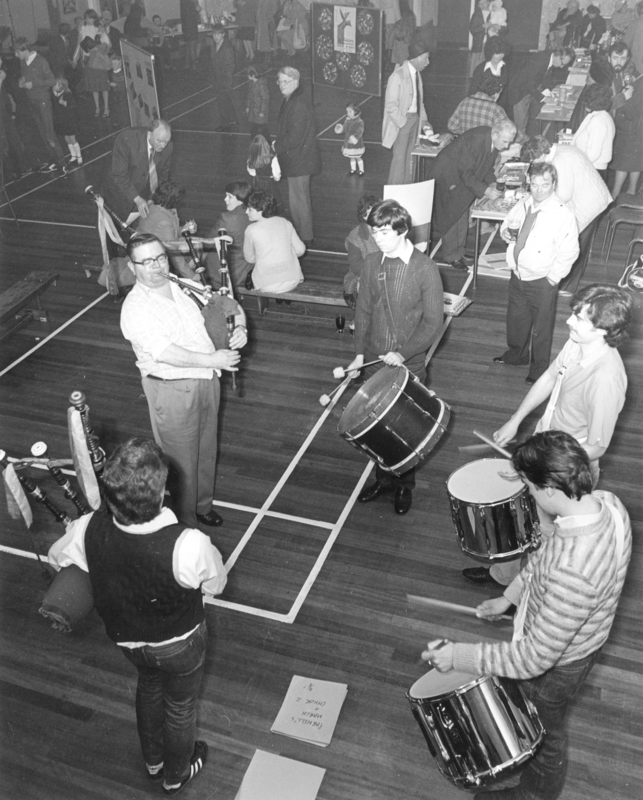 Playing for the League of Friends in the fifties. 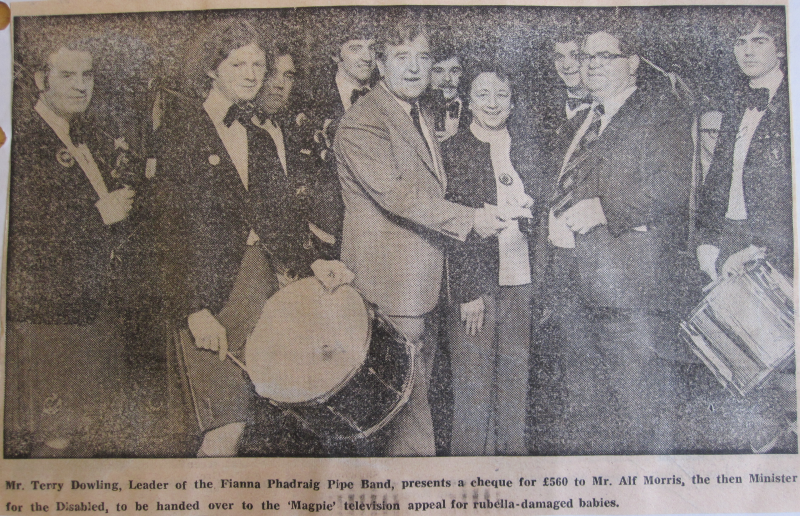 The first Play-In.In February 1979, the Band held its first "Play-In", in response to an appeal launched by the children's TV programme, "Magpie", to collect funds and raise awareness of the consequences of contracting by Rubella (German Measles) during pregnancy. 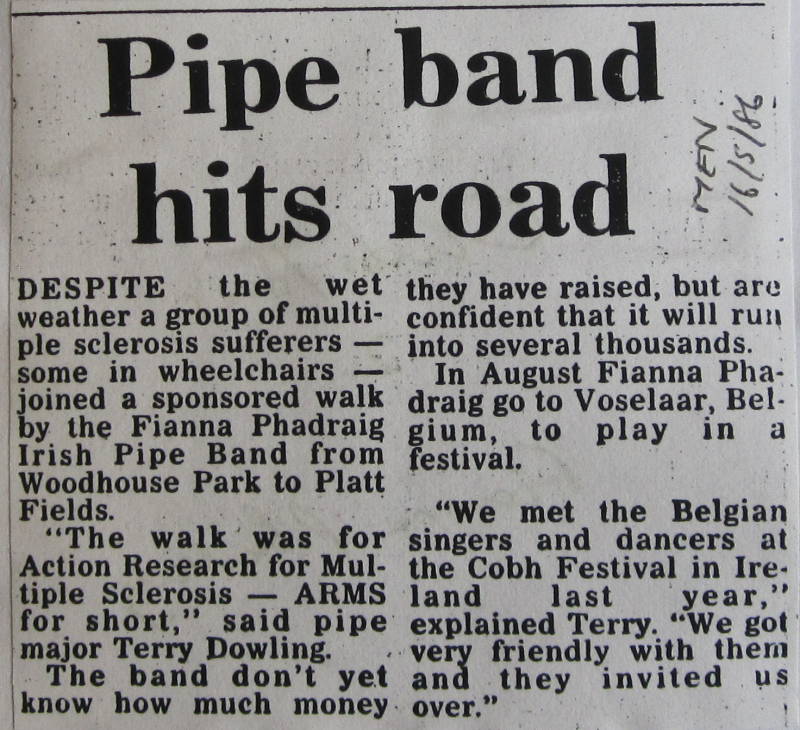 The Band was particularly sensitive to this cause, as Matthew, the nephew of two of our drummers, Bill and Mike Hennessy, was born with disabilities resulting from Rubella. 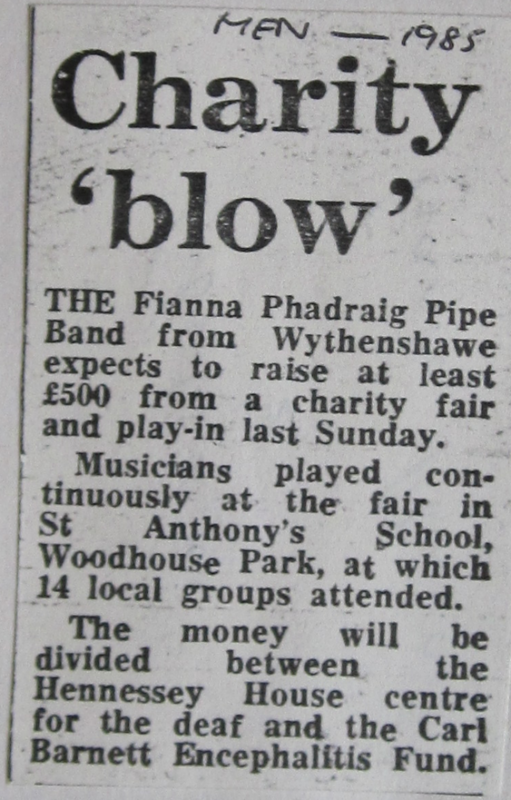 The idea was to play non-stop for several hours in order to raise money through sponsorship. 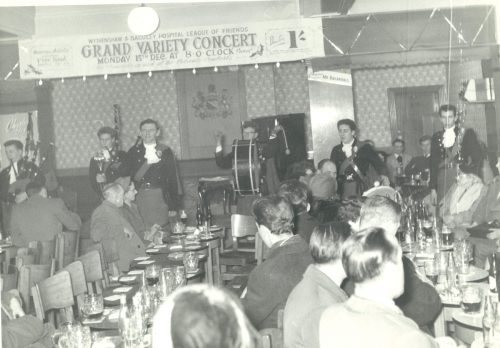 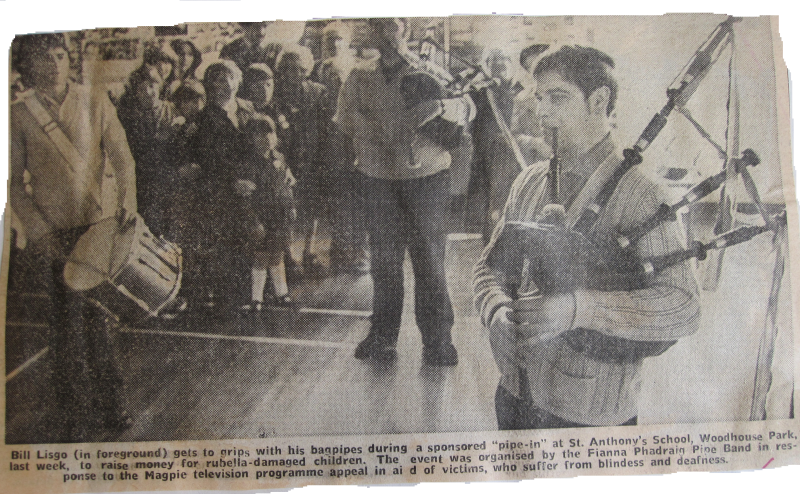 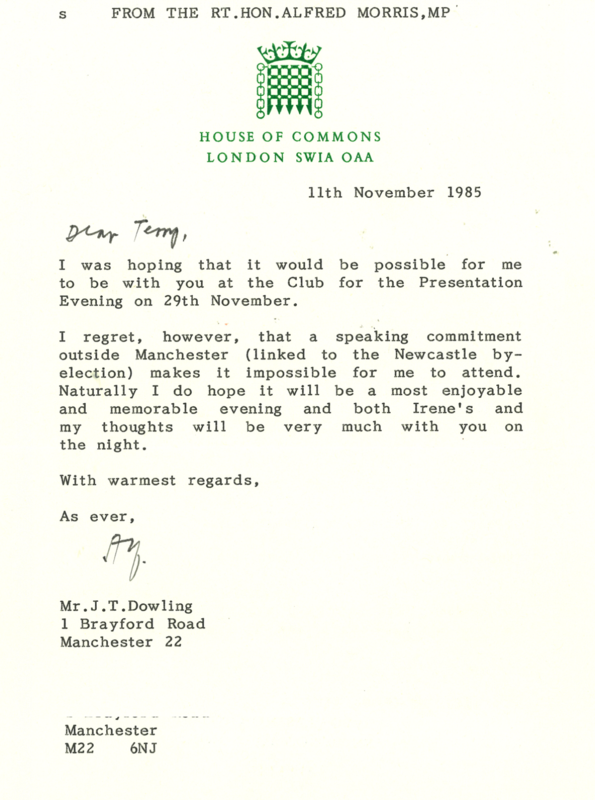 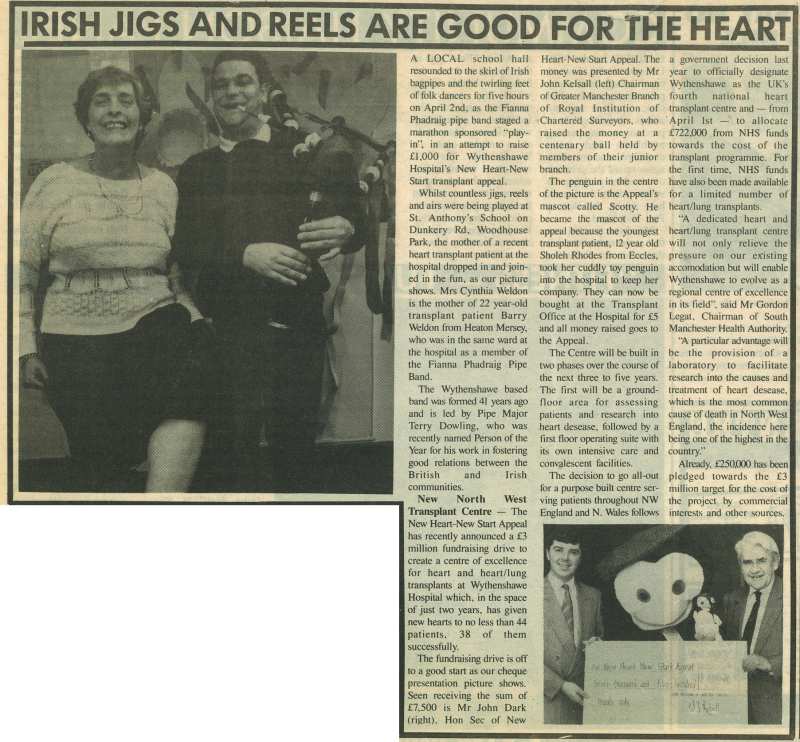 The event, held in St. Anthony's school hall on 25th February 1979, was a huge success and two weeks later, Pipe Major Terry Dowling and several band members handed over a cheque for £560 to our local MP, Mr. Alf Morris, Minister for the Disabled, who personally ensured that the funds raised were paid in to the Magpie appeal. 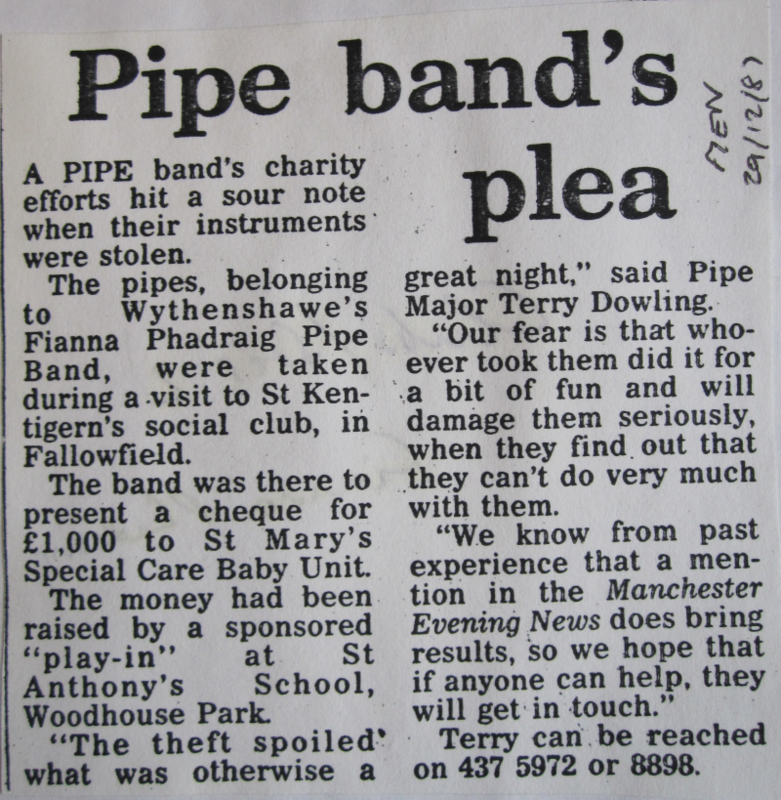 In subsequent years, the Band held more Play-Ins, generally at two-year intervals, raising thousands of pounds for people in need within our local community. 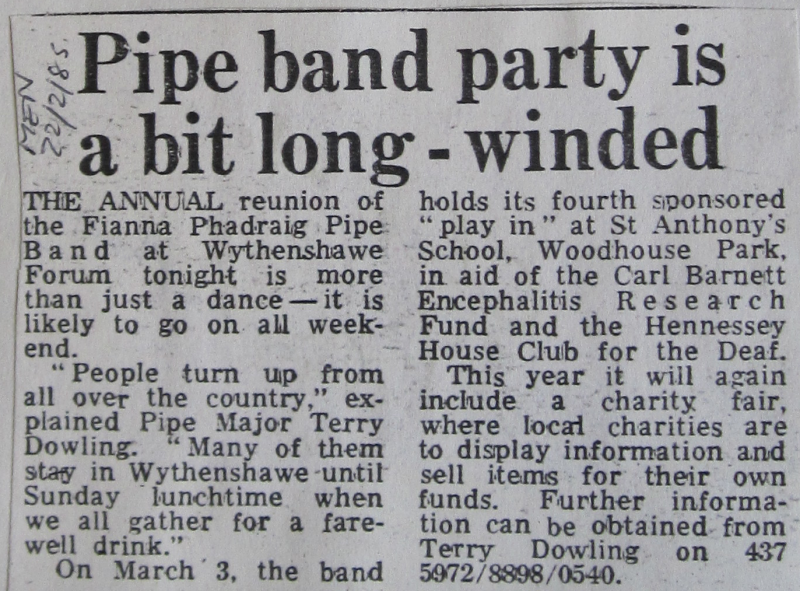 In 1985, the Play-In raised funds for the Carl Barnett Encephalitis Research Fund and the Hennessy House Club for the Deaf in Moss Side. 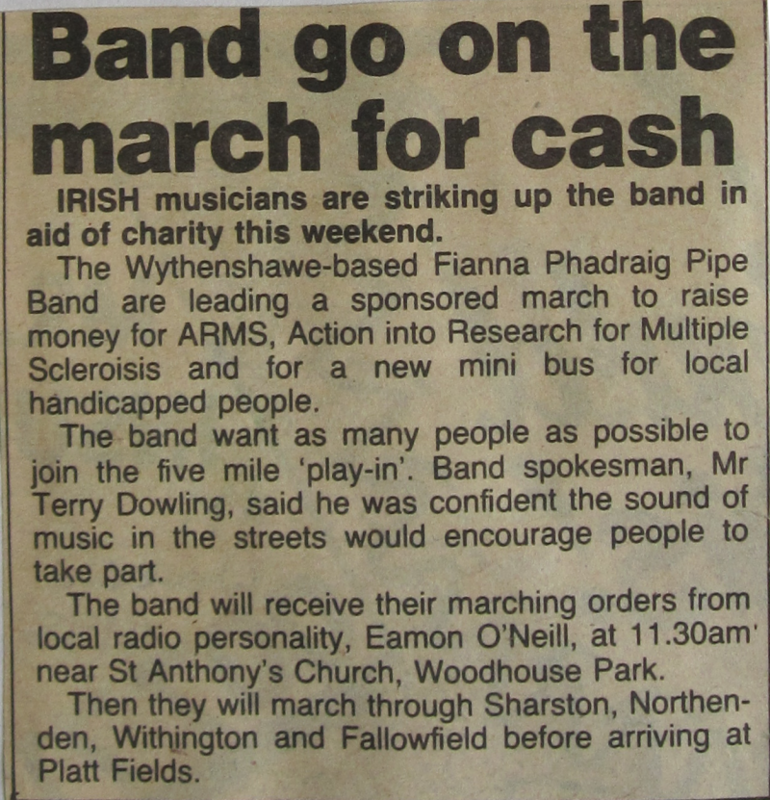 The 1986 Play-In took the form of a 5-mile sponsored parade to the sound of the pipes and drums, leaving from St. Anthony's in Woodhouse Park, through Sharston, Northenden, Withington and Fallowfield, and finally arriving at Platt Fields, in order to raise money for ARMS, Action into Research for Multiple Sclerosis. 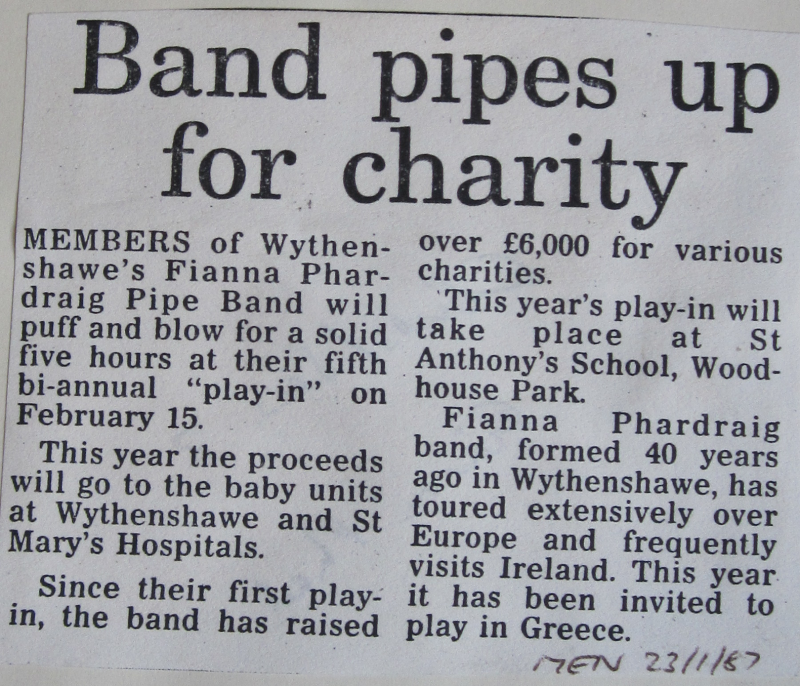 In 1987, the proceeds from the fifth bi-annual Play-In went to the baby units at Wythenshawe Hospital and St. Mary's Hospital. 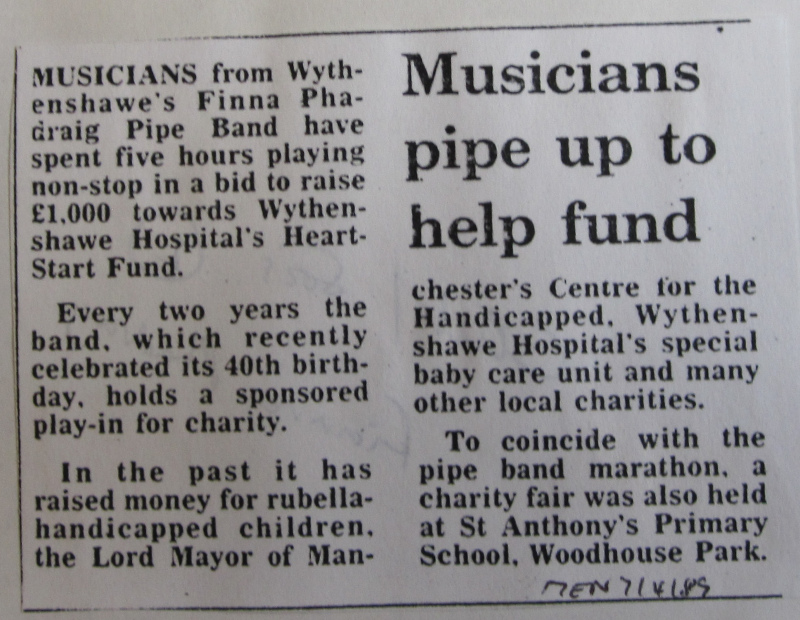 And in 1989, the sum of £1,000 was raised for Wythenshawe Hospital's Heart Start Fund. 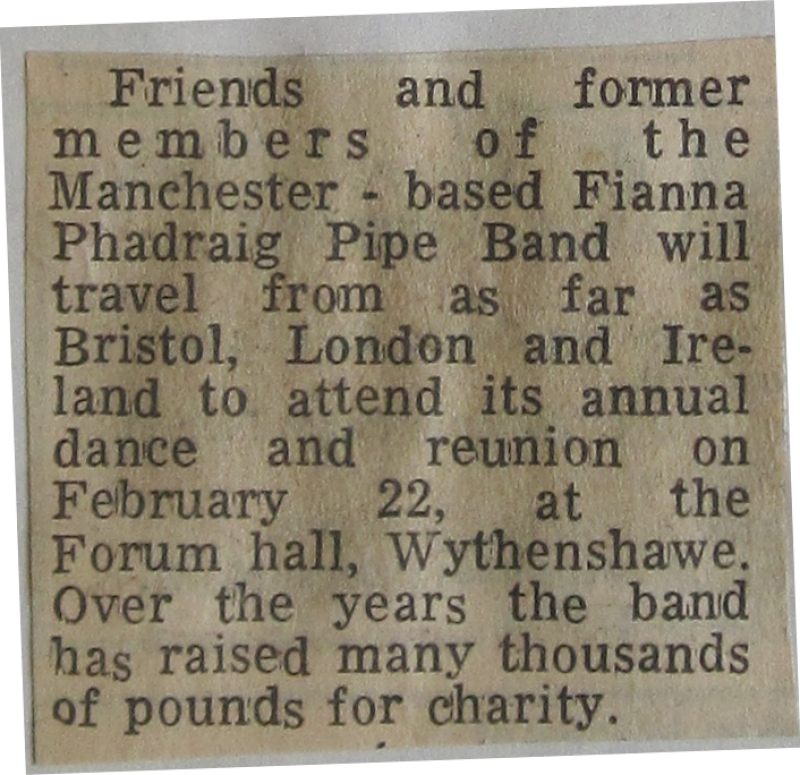 Over the years, the Band has raised thousands of pounds for good causes. 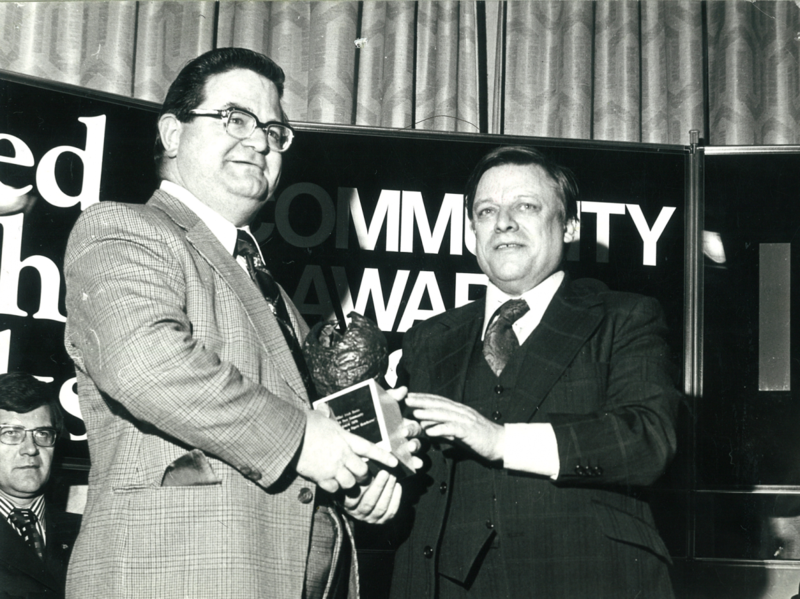 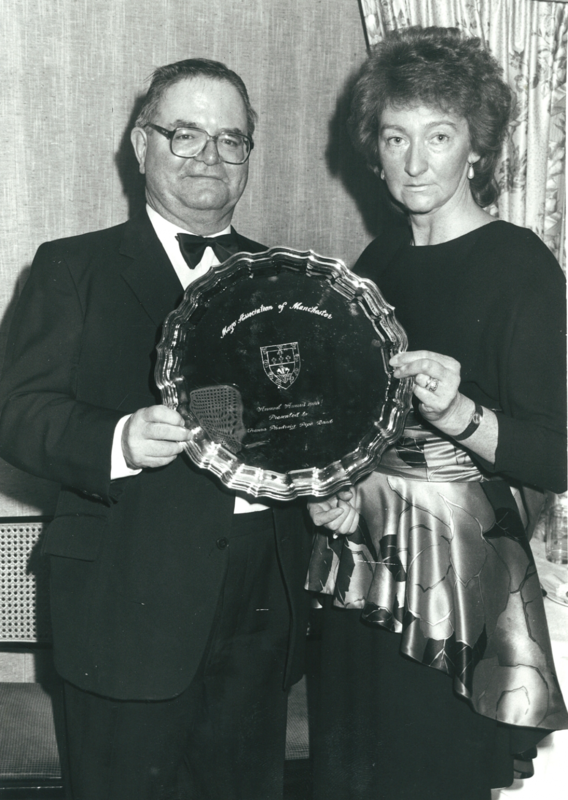 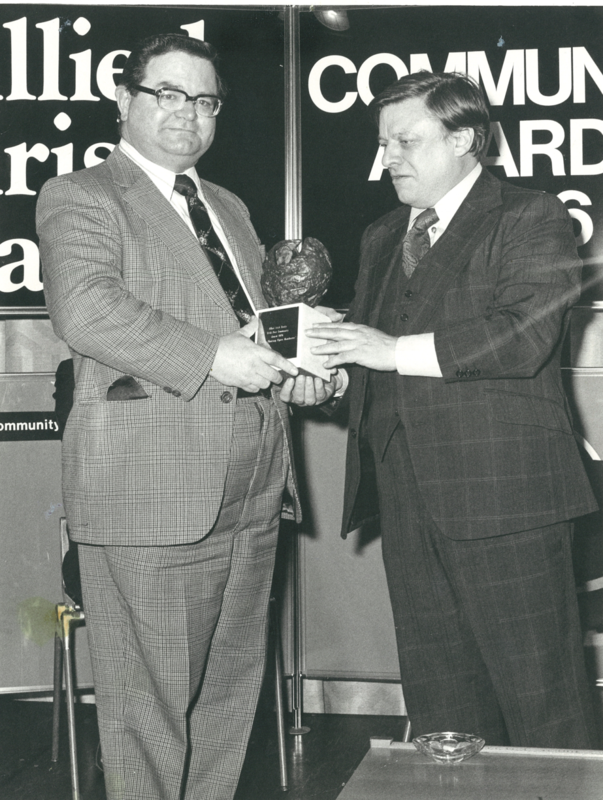 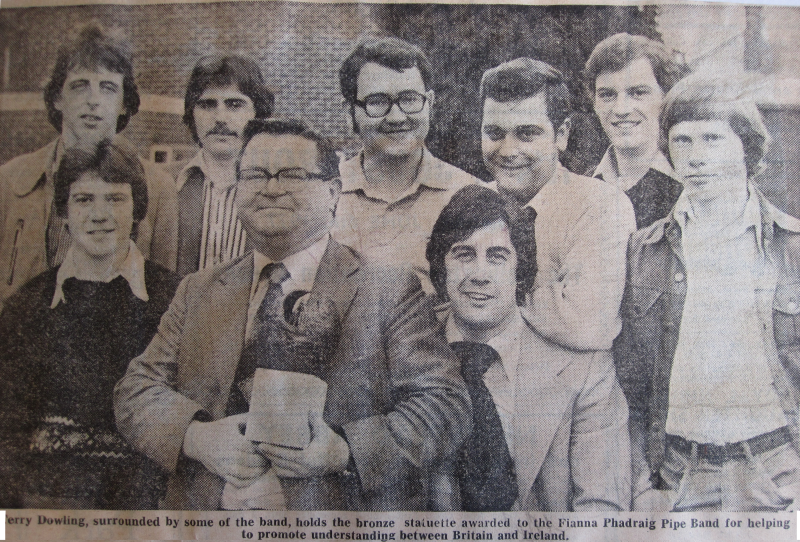 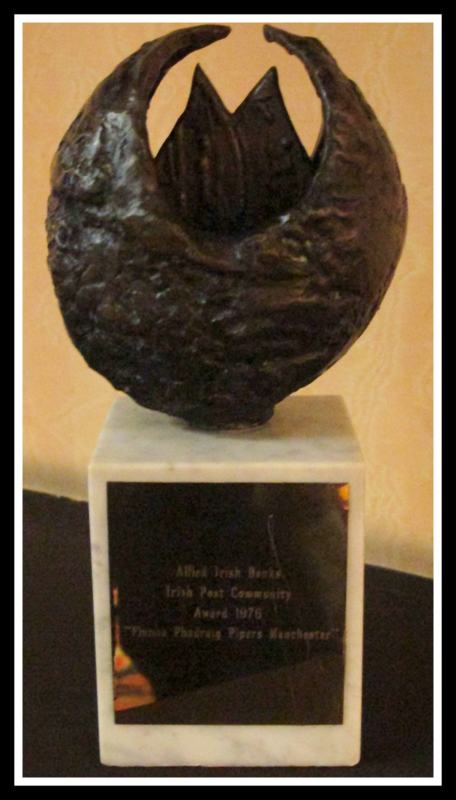 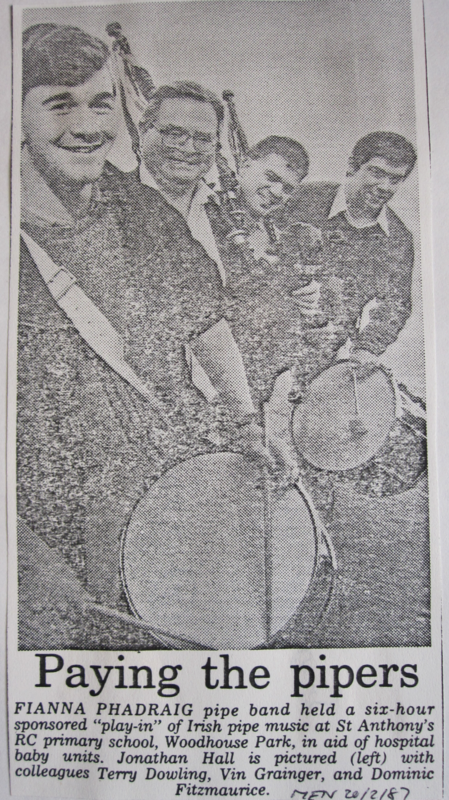 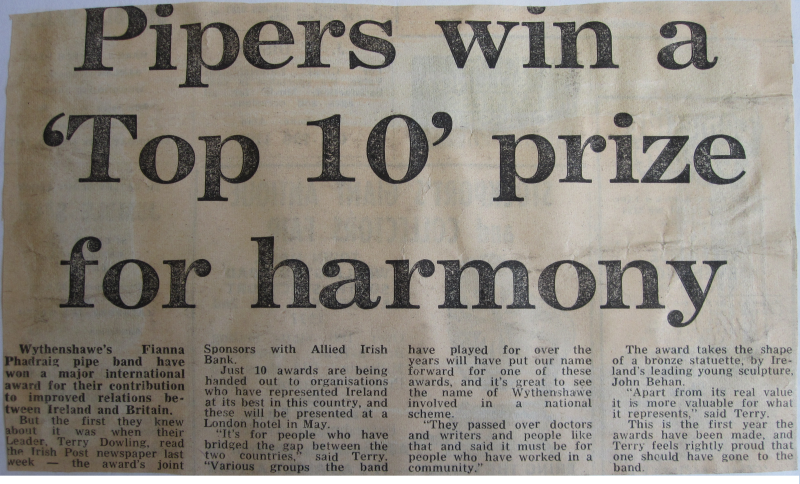 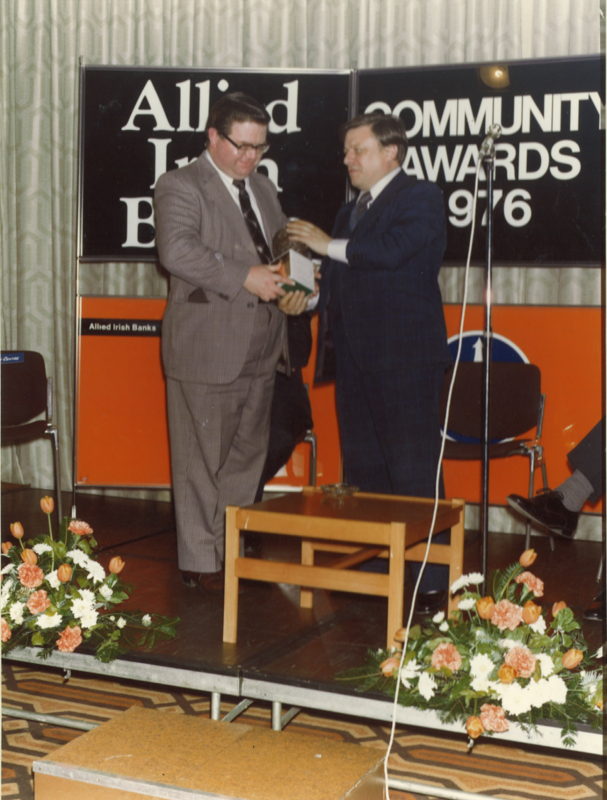 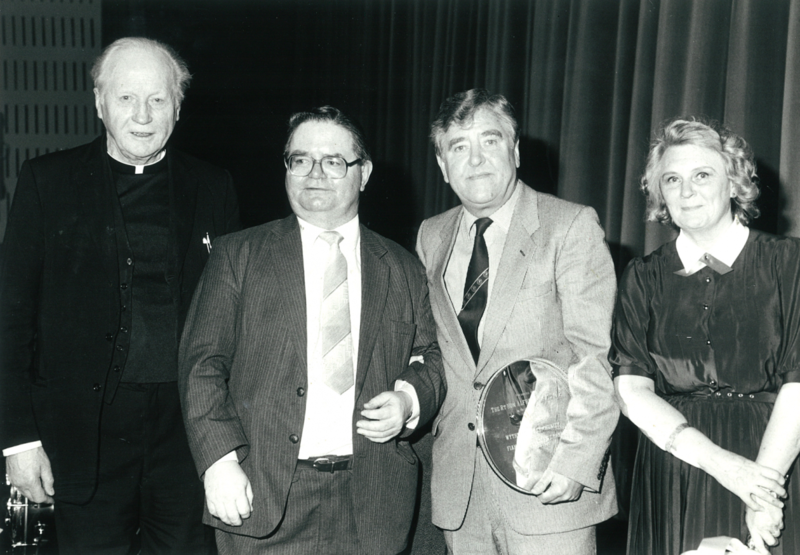 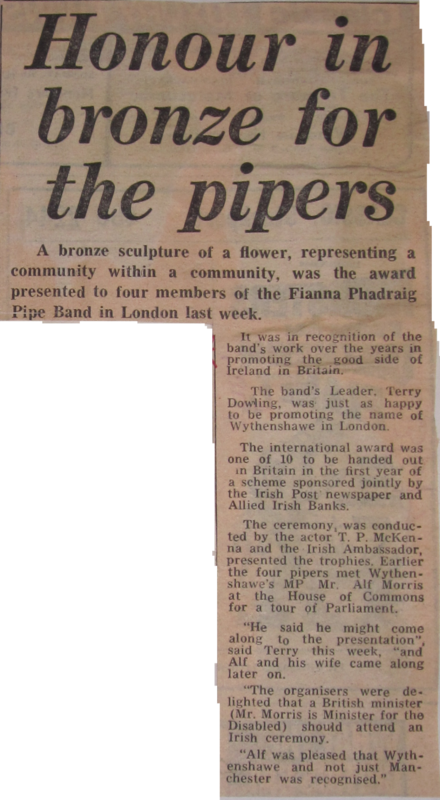 Terry receives the Allied Irish Banks award on behalf of the Band.In 1977, Terry Dowling and three other Band members, Peter Cummins, Mike Hennessy and Tony Rowlstone, travelled to London to receive a major international award recognising the Fianna Phádraig Pipe Band's contribution to improved relations between Ireland and Britain. 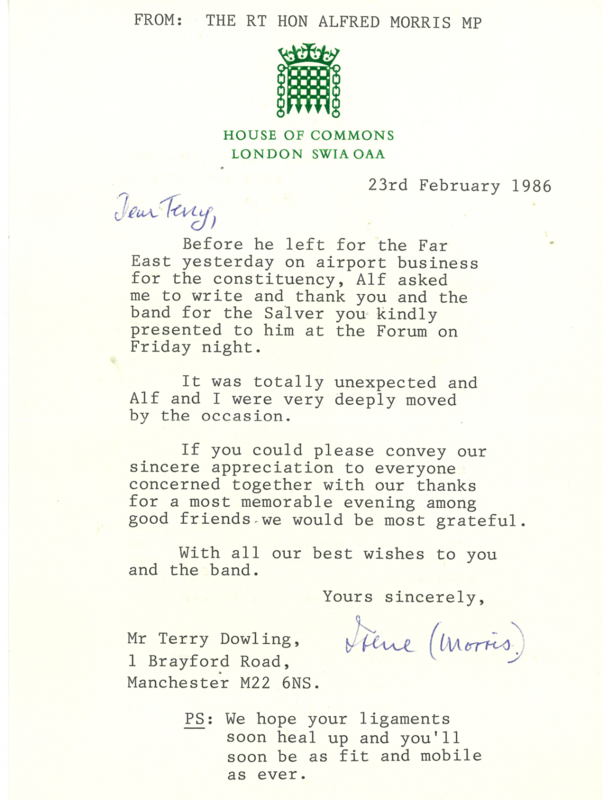 The award came as something as a surprise to Terry and the lads, as none of them knew that the Band had been nominated. 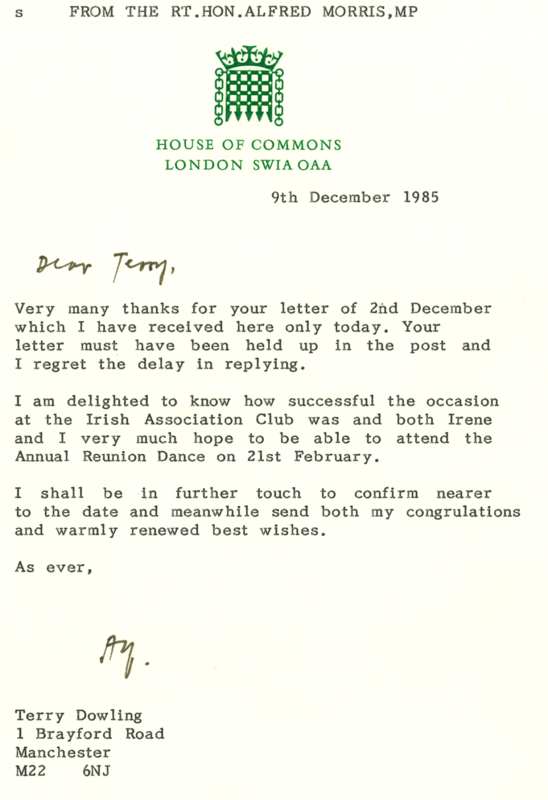 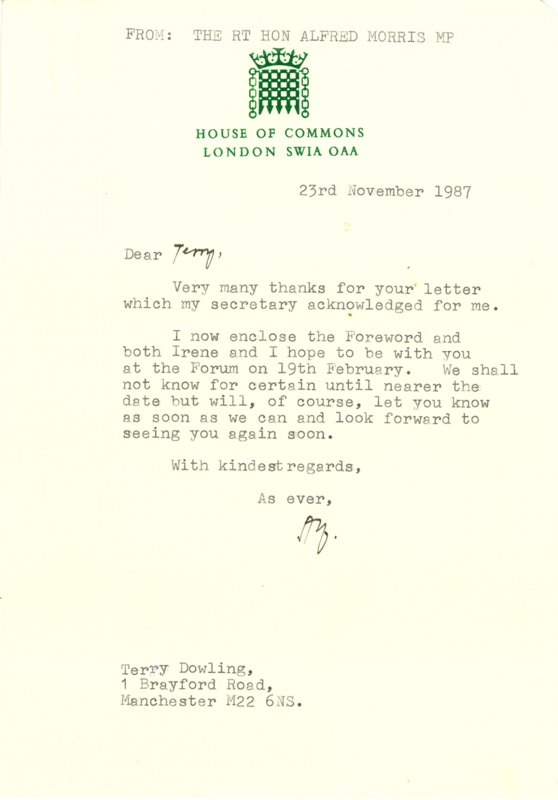 '"It's for people who have bridged the gap between the two countries", said Terry. 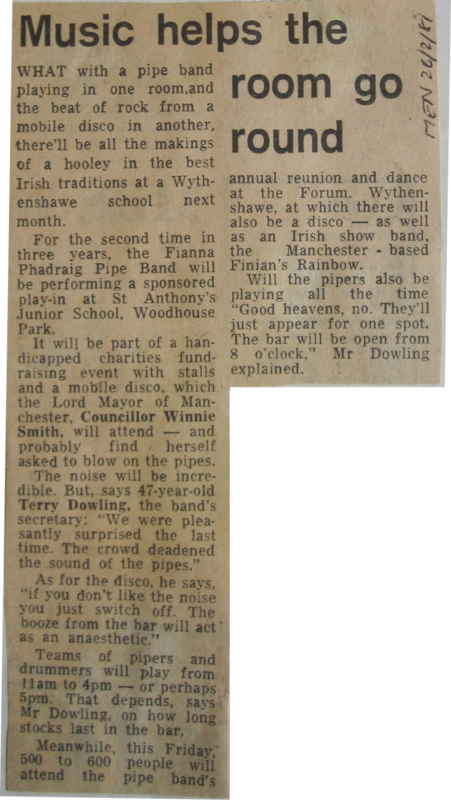 "Various groups the Band have played for over the years will have put our name forward for one of these awards, and it's great to see the name of Wythenshawe involved in a national scheme."' 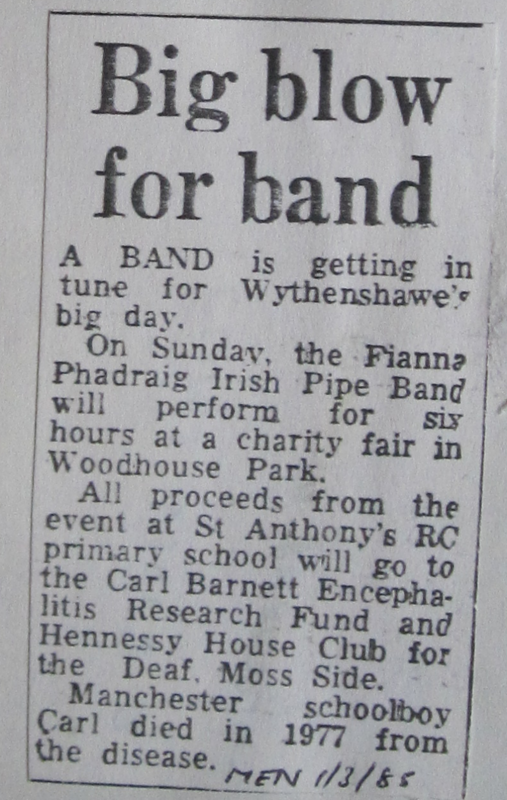 (Wythenshawe Express, 25th March 1977). 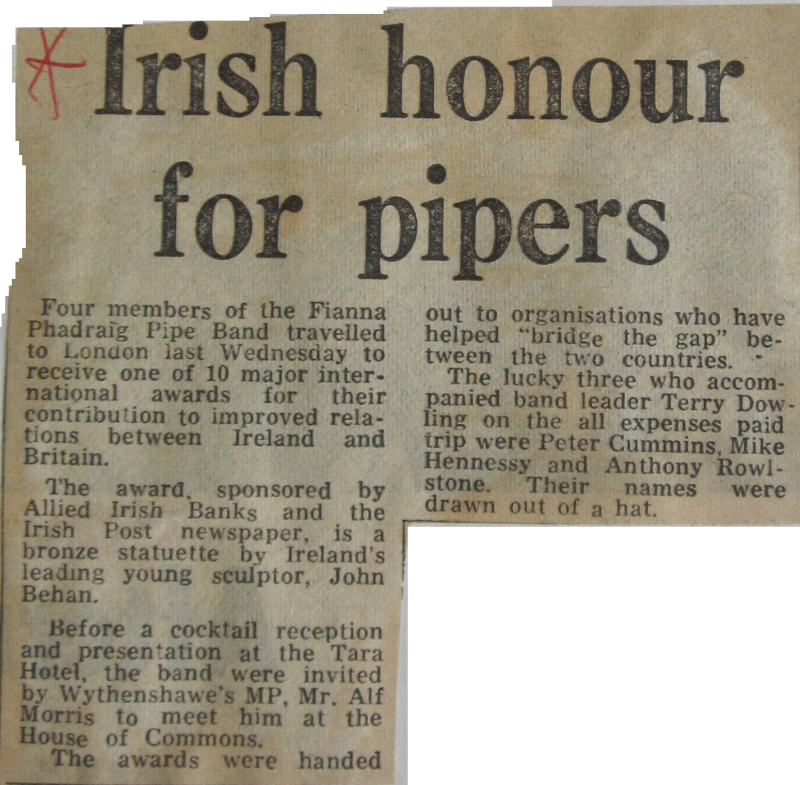 The awards ceremony was attended by Mr. Alf Morris, MP for Wythenshawe, Minister for the Disabled and longstanding friend of the Fianna Phádraig Pipe Band. 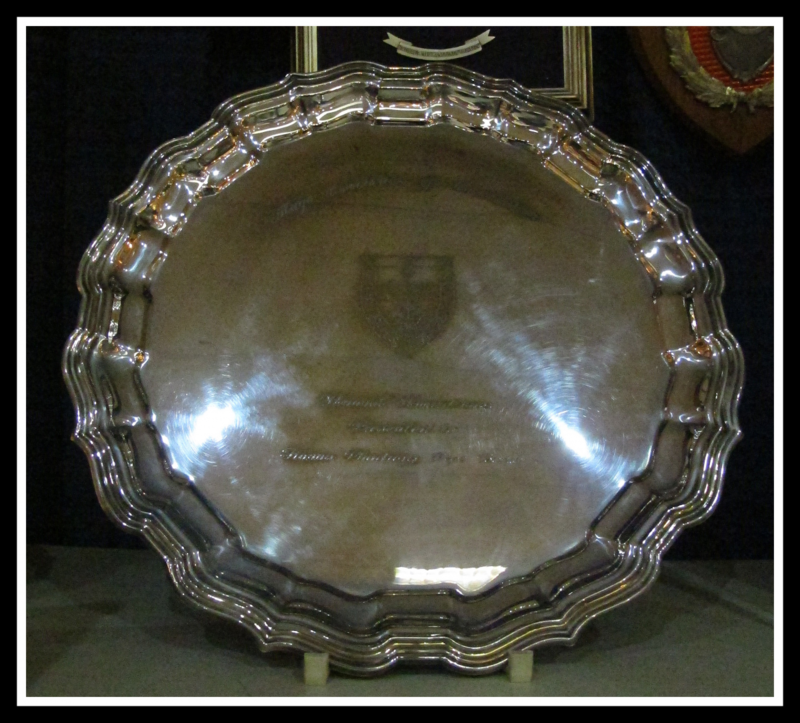 In the afternoon prior to the ceremony, Mr. Morris treated the Band's contingent to a guided tour of the Houses of Parliament, truly an honour for the bandsmen present, but also a day to be proud of for all Band members, past and present. 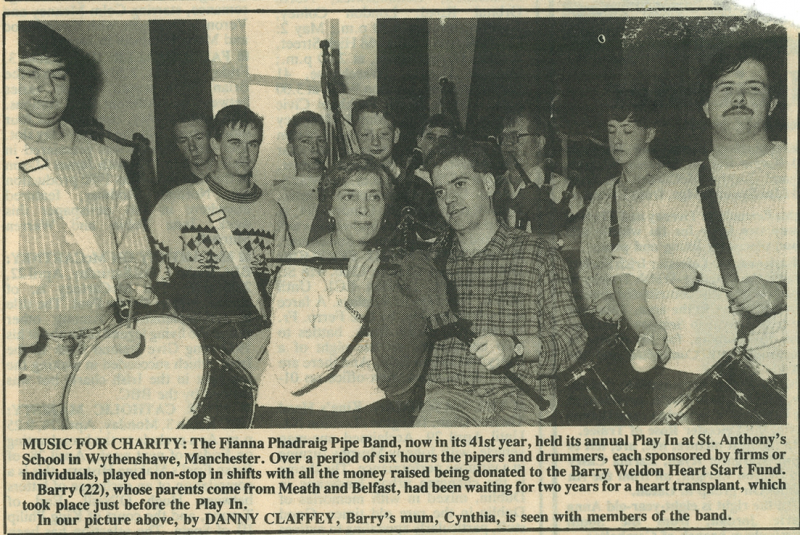 Click on an image below to view photos and items relating to the Band's charity work.